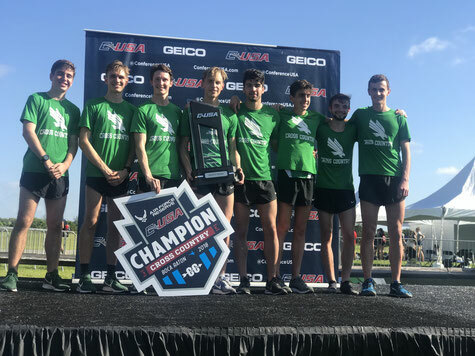 With my third place finish I was able to help my team, North Texas to win the Conference USA Team title. Even though the race in Boca Raton, Florida, took place at 9am, the temperature was already close to 85 ° F. With small chance of winning the title, our team started highly motivated and surprisingly aggressive into this 8k cross country race: After 2000m, we still had most of our runners in the lead pack. It followed a first pace change and I followed the move, setting myself in second position. Over the next kilometers, I kept on hearing the names of my team mates which let me assume that we are in a really good position for a surprise. I followed the leading runner and we were able to gap the rest of the field. After 4k, I was not able to follow the runner from Charlotte and got passed by a second one. With one mile to go, my coach let me know that we are having the same point total as the leading team and we were close to win that race. I gave another effort to catch the guy infront of me but the finish line came a little too early. I finished in 3rd position and watched the next guys finishing, with a surprising number of my team mates in the following places. After a few minutes, we finally got the great message: we just won the C-USA Championships! After placing 4th last year, this victory was definitely a big step forward. We knew that we have a chance to win it but it would take the best races of our top 5 and this worked out perfectly. I am really proud of the improvement of this team and cannot wait for the next races. In just two weeks our next season highlight: The NCAA South Central Regional Championships. Florian you’re a beast brother!